What has Bikram Yoga done for you? Perhaps your story will inspire others? 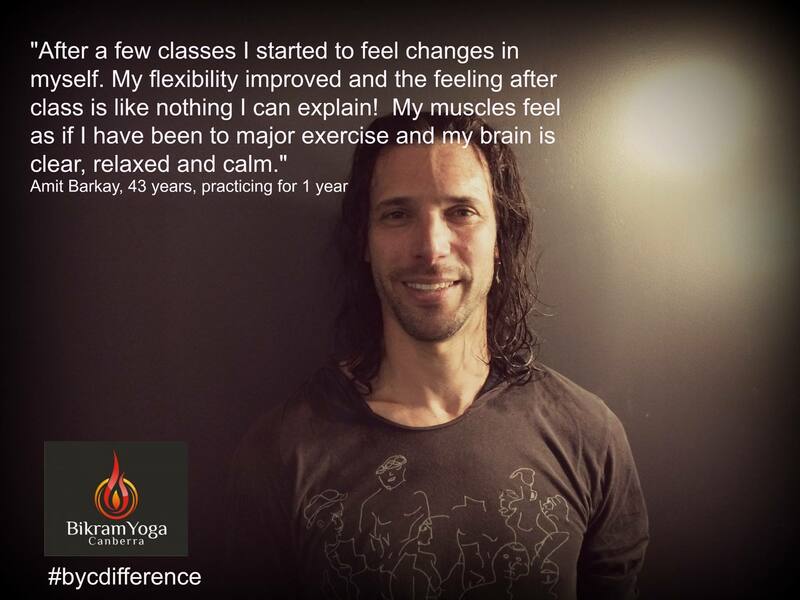 I started Bikram Yoga in March 2014, and have been hooked every since. The main reason why I have become a regular is that it takes me away from my busy life as full time worker, Mum and wife. Yoga gives me time to focus on my fitness, posture and well being. 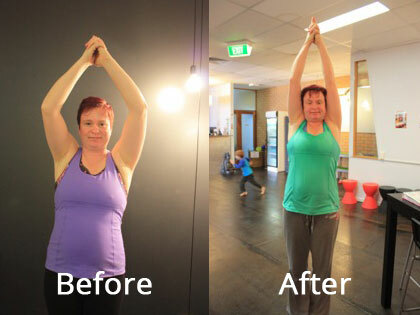 I had the beginnings of a frozen shoulder from September last year and I was encouraged by my Physiotherapist to give up yoga to let my shoulder heal and improve with the multitude of exercises. Much to his initial dismay I ignored his advice and continued with at least three times a week yoga sessions. My Physio is now amazed at the results and recommending yoga to other patients. My practice is modified as I still am unable to complete some postures as well as I wish to, but I am learning to be aware and patient as well as to take care of my body and celebrate the small successes that I am having in the hot room. Thanks to Gill, Tracy, Shanna and Joanna for being so supportive and patient with me. Bikram Yoga has changed my life in such a significant way that when I think of it, it is in terms of before and after. 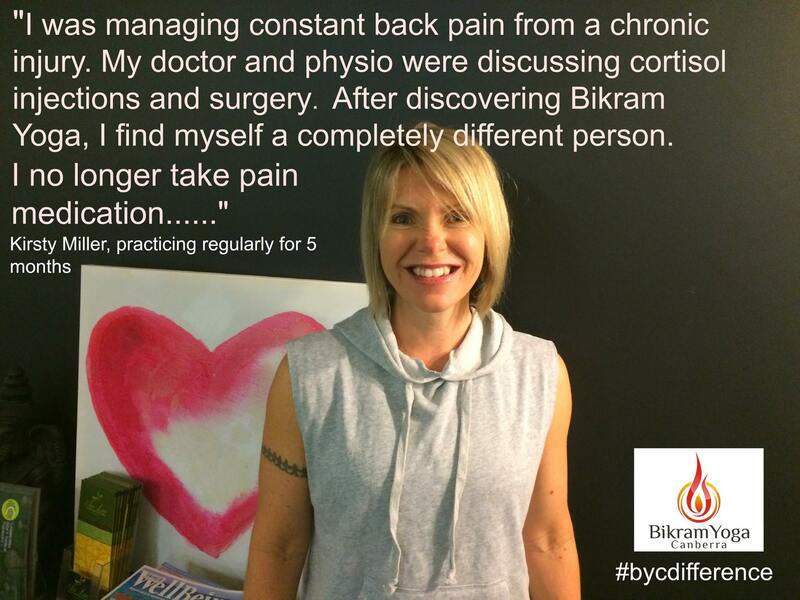 Prior to discovering Bikram, I was managing constant back pain from a chronic injury incurred in a car accident several years ago. As well as significantly limiting physical activity, the pain in my back left me feeling frequently irritable and depressed. Despite working hard to alleviate the pain through incorporating a strength building routine designed by a physiotherapist and personal trainer, regular rest and stretching throughout the day, I was taking increasingly stronger medication on a daily basis. My doctor and physiotherapist were discussing the inevitability of cortisol injections and surgery. And it continued to get worse! After discovering Bikram Yoga and beginning regular practise, I find myself in a completely different position. I no longer take any pain medication and find my increased flexibility and strength to continually benefit other activities such as bike riding and weight training. I am unable to do all the poses as the backbends contraindicate my specific injury but during that time I practise Savasana, focussing on breathing and finding stillness. I find this meditative practise incredibly helpful too. It is worth noting that my husband and children appreciate the decreased stress levels and greater sense of calm and happiness that Bikram Yoga has also brought me. I would recommend Bikram Yoga to anyone – and frequently do! A few years ago I severely injured my lower back. It became so bad that I was seeing a physio and massage therapist weekly and applying heat packs four times a day. On a whim I decided to try Bikram Yoga. It’s been about five months now and I haven’t seen a physio or massage therapist since! I cannot believe the difference Bikram Yoga has made to my life! I’m not longer in chronic pain and my back feels stronger than ever before. Initially I was quite scared of the heat and particularly nervous about doing back bends. However, the specific sequencing of the Bikram poses, combined with careful and detailed instructions from the wonderful yoga teachers made me feel comfortable and safe right from the very first class. 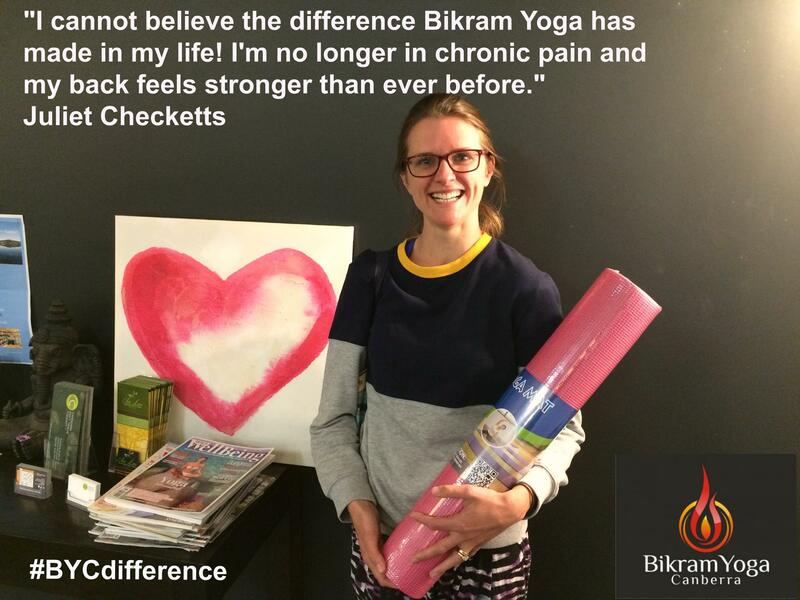 I can’t tell enough people about the wonderful and life-changing benefits of Bikram Yoga! Just give it a go and see for yourself! I tried yoga a few times before but never really liked it. After a conversation with a friend about Bikram Yoga I was intrigued so I enrolled for a trial month. After a few classes I started to feel changes in myself. My flexibility improved and the feeling after class is like nothing I can explain! My muscles feel as if I have been to major exercise and my brain is clear, relaxed and calm. Today, after attending classes for nearly 1 year I can say that I have great improvement in my flexibility and muscle strength as well as better mental clarity and ability to focus due mostly to Bikram Yoga. I started practicing Bikram after being very physically frustrated due to being hit by a car – I went from easily running 15km to not being able to walk for a month (and all the lingering issues) I’ve had a regular practice now for 9 years and I’ve run various half marathons, marathons, ultra trail marathons, hiked to Everest Base Camp, trekked the Kokoda Track and worked as a Volcano Trekking Guide in Guatemala. Bikram keeps me flexible and sane while allowing me to take on anything I wish! On a whim, I decided to check out this Bikram yoga thing I'd heard so much about. I needed to start taking better care of myself, and taking time out for me. That first class was really tough, but I made a commitment to give it a fair shot. After the second class, I was hooked! I was initially self-conscious, but there are no judgements here. Everyone is accepted and encouraged to do their best. Now seven weeks into my journey, I feel stronger, happier, more motivated. I sleep better, and feel more rested. I take care to make sure I'm fully hydrated, which is something I've always neglected. I've cut out soda completely, and my cravings for sweets have virtually gone away. I feel better than I have in a long time, and I'm thankful to the crew at BYC for being part of it. I'm always greeted with a smile, by someone who is genuinely happy to see me come in. The instructors consistently give feedback during class - whether it's a slight correction to your posture, or a "great job" - they keep a watchful eye on everyone throughout the class. They're always happy to go over postures after class if there's anything you're struggling with, and I've learned some good tips this way. All of the instructors really care about each student, and it shows in the way they interact with everyone who comes in. Having such a warm and inviting place to practice, and instructors who are so full of encouragement, makes all the difference. Do yourself a favor and get in here!